Andy Murray fans have hit out after a leading tennis coach said the Scot himself must take some of the blame for his career-threatening hip injury. Jeff Salzenstein, a former top 100 singles player, said he believes Murray has failed to prepare properly off-court and follow the right exercise regime. And he also predicted that Murray – who this week announced his withdrawal from the Australian Open – would never recover fully and return to being the player he once was. In a blog post for his website, Tennis Evolution, Salzenstein said: “Hip injuries in tennis are largely avoidable, so long as you’re regularly doing the right kind of off-court exercises. “I’m sure Andy must have been doing off-court training exercises to help with his hip mobility, but he’s clearly missing something from his programme for his hips to still be so tight and limited. However, supporters of Murray have reacted angrily, saying no one knows the true extent of Murray’s injury – beyond his inner circle and medical staff – and speculating on the cause was pointless. “Andy is meticulous in his preparation and his physical conditioning,” said fan Clare Smith. “To blame the player is ridiculous and very insensitive given the timing. 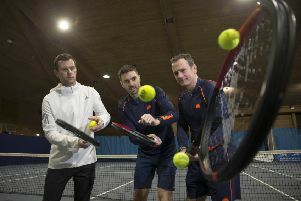 Salzenstein – whose highest ranking in singles was 100 and 58 in doubles – said “the warning bells have already been ringing to Murray for a number of years now, so he’s had plenty of time where he could have addressed these issues”. The American said he believes Murray’s previous issues with his back are connected with his current hip problems. “Prior to his minor back surgery in 2013, Murray had been experiencing back pain for several years. “I’m not privy to the exact details of his back issues, apart from what’s known publicly. But based on what I know about Murray, and my knowledge of the human anatomy, I suspect the true cause of Murray’s back injury was due to his hips being too tight and out of balance. Murray, 30, last played competitively at Wimbledon where he was knocked out by American Sam Querrey. Despite clearly showing signs of injury, the Scot – a three time Grand Slam champion and twice Olympic gold medallist – refused to retire and completed the match. Aside from an exhibition match at the SSE Hydro in Glasgow against Roger Federer, he did not feature again in 2017, hoping rest would allow him to recover. But after pulling out of a warm-up event in Brisbane, Murray was forced to concede that he was not ready to compete at Grand Slam level. He continued: “Players who’ve suffered major hip issues and have managed to make a full recovery and comeback are few and far between. “But as for players who haven’t managed to make a comeback after hip injuries? There’s examples a plenty. “Greg Rusedski, Fernando Gonzalez, Gustavo Kuerten and Magnus Norman are just a few that come to mind. All of whom had their careers ended due to hip injuries.